Border patrol agent Dennis Dickey’s big gender reveal explosion, seen at the precise moment it sparked a 47,000-acre wildfire. The Arizona border patrol agent who used a firearm to detonate explosives during a “gender reveal” party in April 2017, sparking a wildfire which eventually spread across 47,000 acres and caused $8.2. million in damage, pleaded guilty earlier this year to a misdemeanor and received a sentence of five years’ probation and an order to pay $220,000 in restitution. Now, courtesy of the Arizona Daily Star, we have footage of the exact moment that he realized this might not have been his smartest move. The 49-second video clearly shows the fire starting in yellow grassland near a stand of mesquite trees from the exploding target on state land in the Santa Rita Mountain foothills on April 23, 2017. Towards the end of the video, a male voice is heard saying “Start packing up!” twice. The Star obtained the video from the U.S. Forest Service through the Freedom of Information Act. The service, which led the investigation into the fire’s origin, blacked out persons shown in the video. In a letter to Star reporter Tony Davis, Forest Service official Tracy Perry cited two exemptions to FOIA allowing the withholding of information to protect peoples’ privacy. Perry is the service’s director of Law Enforcement and Investigations. The blaze, dubbed the Sawmill Fire, took nearly 800 firefighters to put out. Tannerite is made up of mostly aluminum powder that’s mixed (after shipping) with an oxidizer (ammonium nitrate or similar). It doesn’t blow up if you drop it, and its manufacturer claims it is designed to be non-flammable. It does, however, blow up if you shoot it with a high-velocity rifle round, which makes it practically irresistible for bumbling owners of high-velocity rifles. Most of the time people shoot at smaller, half-pound Tannerite targets, which made a satisfying bang when you hit them. Dickey not use a half-pound target. A kit with two pounds of Tannerite and 15 pounds of colored powder runs for about $97 online before shipping, but for those inclined, buying two kits and using four pounds of the explosive is an option. 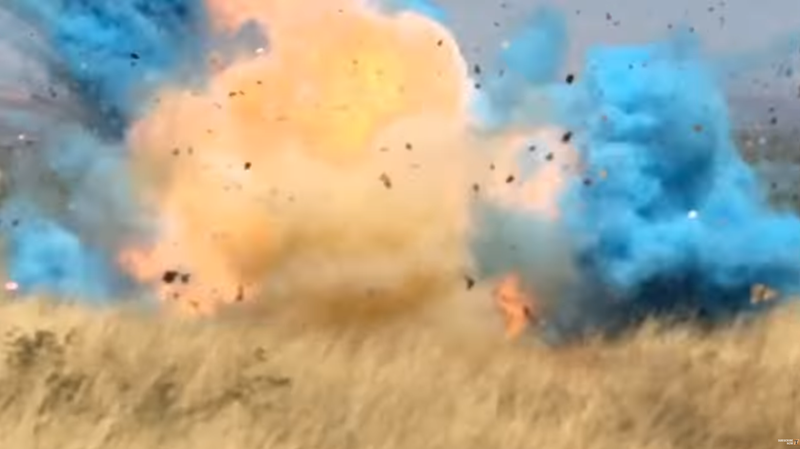 Here’s a gender reveal video from a YouTube channel named PilotPatriot using four pounds of the explosive, which looks to be roughly similar in size to Dickey’s (it’s hard to estimate from video alone, but this video of a two-pound Tannerite explosion definitely looks a bit smaller). Splinter’s Jack Crosbie contributed additional reporting (and insights on the use of firearms and Tannerite to blow up things) to this article.